Qaraqalpaqstan is a strange sort of place: a virtual nation dreamed up by Soviet planners in the 1920s with no proper history of its own; remote and isolated, surrounded by desert sands in every direction; a population of traditional livestock-breeders who raised cattle in the waterways and reed beds of the Amu Darya delta and sheep, goats and a few camels on the surrounding desert sands; transformed by Communism into a land of cotton monoculture, striving to meet the ever-rising production targets of Soviet Five Year Plans; the location of top secret chemical and biological weapons testing sites during the Cold War, out of bounds to foreign eyes; and now a poor and neglected part of independent Uzbekistan, trying to come to terms with the increasing environmental damage caused by the shrinking Aral Sea. A simple schematic map of Qaraqalpaqstan. The separate province of Khorezm is part of Uzbekistan. The populated areas are confined to the banks and delta of the river Amu Darya. The initial impression of first time visitors to No'kis, the provincial capital, tends to be negative and depressing. Those visitors who make it to the ship's graveyard at Moynaq often find that experience equally unsettling. "Nukus is a grim, spiritless city of bitter pleasures whose gridded avenues of socialism support a centreless town, only to peter out around fading fringes into an endless wasteland of cotton fields punctuated by the random, surreal exotica of wild camels loitering in neglected apartment blocks. It is the capital of Karakalpakstan, an ill-defined autonomous republic inside Uzbekistan and thus the regional centre and transport hub of the republic." The centre of No'kis, capital city of Qaraqalpaqstan. 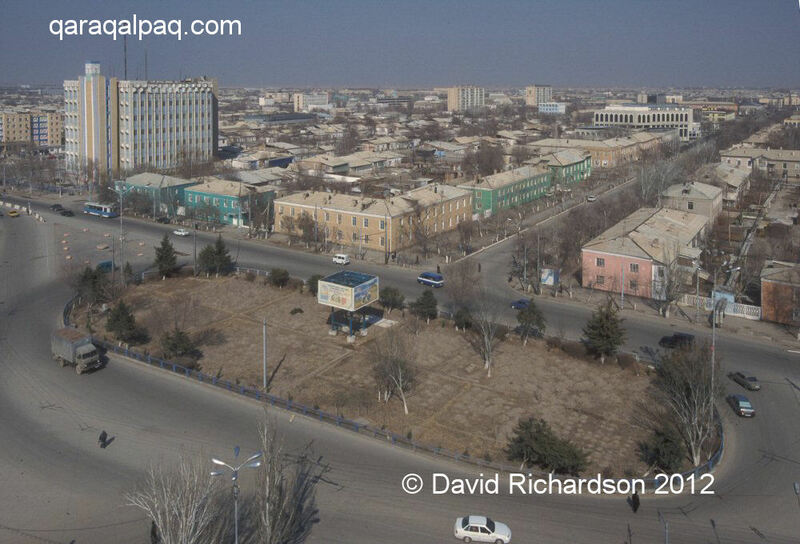 The journalist A A Gill penned an article for the Sunday Times Magazine in 2000, describing Qaraqalpaqstan as "the worst place in the world". Gill was following in the footsteps of many previous journalists who had paid a flying visit to No'kis and Moynaq following Uzbek independence, only to churn out the same weary article about the countless problems faced by the inhabitants of this remote and run-down province, primarily as a result of the Aral Sea disaster. Gill deliberately took the extreme view, exaggerating every negative aspect of the region to create a one-sided and unbalanced picture. Even the photographs illustrating his article were printed in black and white in order to convey the bleakest impression. Qaraqalpaqstan is a poor country with more than its fair share of problems. But not everything is gloom and doom. Of course, all short-term visitors to any country go away with a totally false picture of the place they have just visited. It takes time to get below the surface and to understand what life is really like. One of the main reasons that first-time visitors go away with such a bad impression of Qaraqalpaqstan is that most tour companies still book guests into the abysmal Tashkent Hotel � certainly a prime candidate for the worst hotel in the world. Had they enjoyed the hospitality of a local family they might have left with a completely different attitude to the region. Qaraqalpaqstan has two great assets � its people and its location. The inhabitants of Qaraqalpaqstan � Qaraqalpaqs, Khorezmian Uzbeks, Qazaqs and Turkmen - share the same great tradition of friendliness and hospitality found throughout Central Asia. As a visitor, you can arrive unannounced at a home anywhere in the delta and be welcomed, invited to sit in the living room, be brought tea and snacks, and, if you choose, spend the whole day with the family. People will gladly show you their family photos or scant possessions and will even offer to kill a chicken or a sheep so that you can stay longer and share a meal with them. Can you imagine a similar welcome if you knocked on a door unannounced in the West? Life revolves around the family and community ties remain strong. Even in the cities three generations of one family tend to live together in the same house and members of the extended family will live close by. In small villages the whole community may be interrelated or at least belong to the same clan. Children are brought up to respect their parents and their elders and in later life will unquestioningly take responsibility for the welfare of their ageing parents. This is not just a matter of tradition but of economic survival in a country with minimal social security. Families take responsibility for themselves. Qaraqalpaqstan is mostly uninhabited desert. Image courtesy of MODIS Rapid Response System, Goddard Space Flight Centre, NASA, 2003. Qaraqalpaqstan is remote. To the east the sands of the Qizil Qum stretch as far as Bukhara. To the south the empty Qara Qum desert reaches the foothills of the Kopet Dag and Ashgabat. To the west the barren rocky plateau of the Ustyurt extends to the shores of the Caspian Sea. To the north an enormous barren landscape of desert and salty lakes eventually merges into the Russian steppes and the frontier towns of Orenburg and Samara. Qaraqalpaqstan covers about the same land area as cotton-growing Oklahoma but has a population only half of its size. 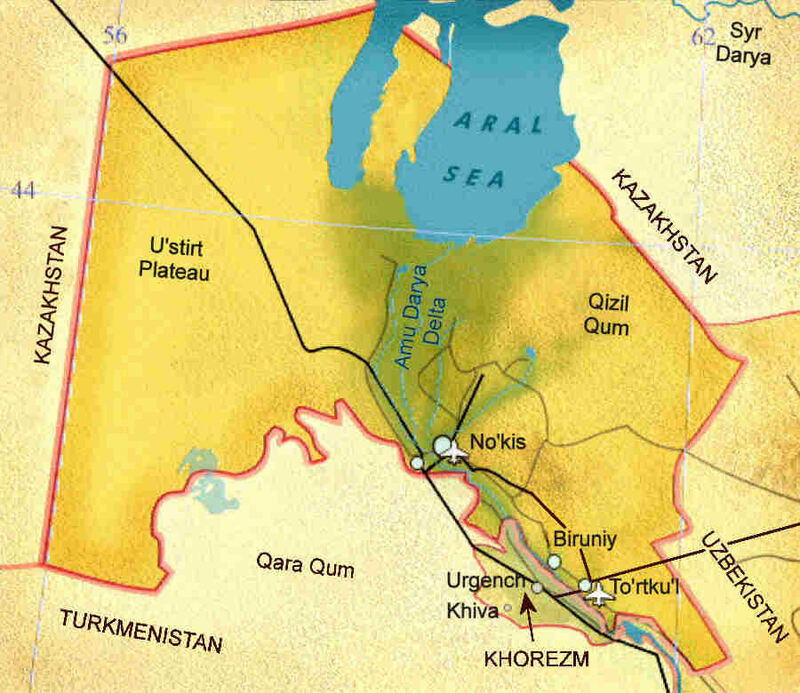 However in Qaraqalpaqstan people mainly live in the irrigated regions close to the Amu Darya, so most of the province consists of uninhabited and remote wilderness: the flat white sands of the Sarykamysh delta, the Ustyurt plateau with its birds of prey and vast hordes of saiga deer, the saxaul-covered dunes of the Qizil Qum, and the strange vegetation of the seashell-covered Aral Qum � the dried-out bed of the former Aral Sea. 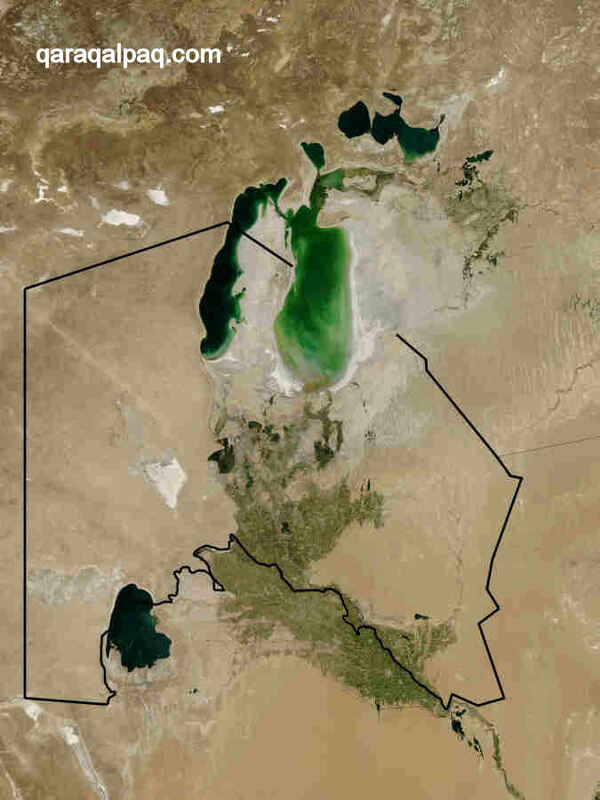 Although the Aral Sea has lost 95% of its water over the past half century, it still covers a huge area. Despite being labelled a disaster zone, it remains spectacularly beautiful, bordered along its western edge by the dramatically contoured and coloured cliffs of the tchink. To watch the sunrise over a turquoise and aquamarine Aral Sea, devoid of any vessel, port, town, village or other human being is a humbling experience, never to be forgotten. This page was last updated on 1 February 2012.